CS Comment: Do radios make racing boring? Race radios make bike races less interesting and unpredictable, and the argument from the teams, that they are primarily for safety, is a red herring. 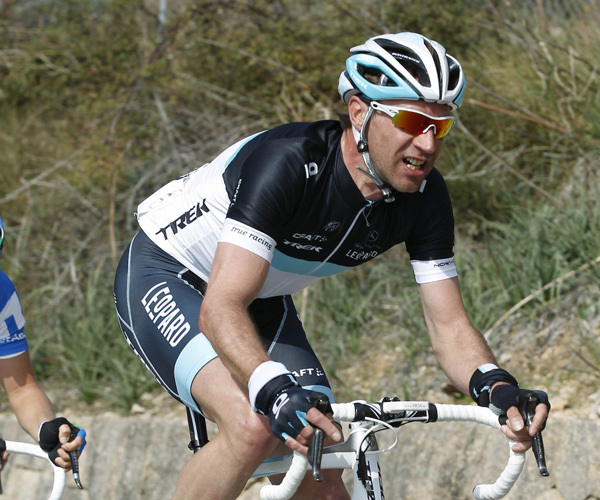 It was interesting to see the usually eminently sensible Jens Voigt stray into the emotive and emotional when talking about the debate over the use of race radios this week. And of course, only a lunatic would suggest otherwise. No one wants riders to die for their sport. But let’s think about this for a second. What evidence is there to demonstrate that riders would be at greater risk of serious injury if they were to be disconnected from their sports directors? Using such powerful language is perhaps designed to win over the fans, who remain unconvinced by the arguments so far. On the issue of fatalities, it is worth bearing in mind how long and hard the professional cyclists and their various unions fought to stop hard shell helmets being made compulsory by the governing body. It may be unfair to level this particular point at Jens Voigt specifically, but his predecessors went on strike at Paris-Nice in 1991, forcing the UCI to allow the riders to race without wearing what then looked like bulky upside down pudding bowls. It wasn’t until Andrei Kivilev died at the same race 13 years later that sense finally prevailed. If the objection to the ban on race radios is a matter of safety then surely a compromise can be found. Perhaps the riders could be tuned in to a version of Radio Tour so they can hear certain pertinent information from the race director. That way, they can be warned of any dangers ahead and could be kept abreast of time gaps without receiving the tactical direction from their managers which some observers say stifle competition and nullify the races. Mick Rogers Tweeted last month to pooh-pooh that idea, asking whether there’d be time to translate the information into all the different languages in the peloton. But that’s a moot point. How many teams converse in five or six different languages anyway? They don’t. Each team adopts an official language or operates in, at most, two languages. Saxo Bank, a Danish team, ‘went English’ a few years ago, for example. The official languages of the UCI are French and English. It wouldn’t be asking too much for the race radio feed to be in the language of the race (Flemish at the Tour of Flanders, Italian at the Giro, French at the Tour and so on) as well as English. And as Sean Kelly says, if your living depends on it, you’ll soon learn what you need to learn. At the launch of his An Post team earlier this week, one of the Lithuanian riders was asked how his understanding of Flemish was coming along. Kelly made some very interesting points when we talked about the issue of race radios before the An Post team launch earlier this week. His contention was that, in the short term at least, racing may become even more negative and controlled without radios because teams will not want things to get out of control. And that is a very valid point. But perhaps, sooner or later, that culture would change. The odd unpredictable event would soon shake things up. Riders may be persuaded to think creatively knowing they have a better chance of success. As someone who has created a team to develop young talent, Kelly conceded there was a danger that too many riders were becoming unable to think tactically for themselves. Philippe Chevalier, the head of the UCI’s road commission, is the man behind the race radio ban. He was at the track World Cup meeting in Manchester at the weekend. He explained that the reason for the ban was because, in the UCI’s opinion, the racing has become sterile. Too often, he said, you know the outcome before the start. That is not to say the identity of the winner is necessarily known, more the manner in which the race will unfold. Races are being run to a set pattern. It seems incongruous to ban something that has been permitted for more than a decade and the decision leaves the UCI open to accusations that they are Luddites who want to ban technological developments. Nevertheless, Chevalier is determined to extend the ban to the World Tour races in 2012, although he is bracing himself for more protests along the way, perhaps as soon as Saturday’s Het Nieuwsblad in Ghent. The teams have settled on the safety issue as their main objection, partly because it’s the sort of check-mate move that is difficult to counter. But what is lacking so far in the debate is the willingness to compromise. The UCI wants a ban, the teams don’t. But no one has yet managed to come up with a convincing argument to say that racing with radios is more entertaining. And that is because, by and large, it probably isn’t. Of course, you could look back and pick out some of the most exciting races that would have been very different if the riders had been using radios. Cycle Sport’s series of Classic Races looks back at great or unusual races in the history of the sport. I’ve got no doubt that radios would have changed these races, for the worse. For example, look back to the 1982 Milan-San Remo, which we featured in CS June 2010. Would Marc Gomez and Alain Bondue sprung such a surprise on the bunch if the favourites had been made aware of the danger by their team directors and got their act together earlier? Would Moreno Argentin have been able to creep up on Claude Criquielion and Stephen Roche, catching them completely unawares in the finishing straight at the 1987 Liège-Bastogne-Liège? Would Jacky Durand have stayed away to win the Tour of Flanders in 1992 if the team managers had been telling the chasing riders to get their act together and stop playing brinkmanship with each other? (See CS May, out soon, for our re-telling of this great story). 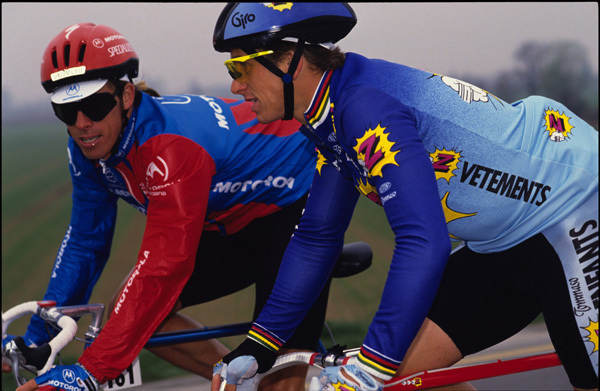 Would Steve Bauer, Claudio Chiappucci, Frans Maassen and Ronan Pensec have been able to gain 10 minutes on a ponderous peloton at the end of the first road stage of the 1990 Tour? That is not to say that there weren’t boring races pre-radios and that there aren’t great races these days with them, but the style of competition has changed. The reason the teams want to use radios is because it reduces the chance of anything unpredictable happening. The teams are acting in their own interests and while there is nothing particularly wrong with that, they must not be allowed to do so at the expense of the sport or the people who, directly or indirectly, fund it. The team directors do not want a ban because it drastically reduces their influence, reducing them to the role of glorified car drivers, which might lead to a drop in salary too. The teams want the radios because they have sponsor investment to justify and protect. If a race profile determines that, by rights, the race should end in a sprint, that’s what the teams with a sprinter want to happen. They don’t want a group going up the road and staying away. The teams want as much information available to them so they can make informed, logical decisions. But informed, logical decision-making is the enemy of compelling televised sport. It’s the enemy of unpredictability, which is, after all, one of the things that is interesting about sport. The chief problem the teams have is that, broadly speaking, the fans do not share their view. The fans want unpredictable racing. They want a certain anarchic spirit. They want to see the apple cart upturned. They relish the idea of the underdog putting the favourites on the rack. And they want to see the big names panicked once in a while. Severing the umbilical cord back to the team cars would do that. It is no surprise that when our sister magazine Cycling Weekly runs its annual end-of-season poll, Paris-Roubaix always wins the most exciting one-day race category. It’s why the Montalcino stage of the Giro, which turned to mud, quickly gained epic status. That day the conditions rendered any direction from the team car irrelevant. The uncertainty is why the fans tune in. And what the fans want does matter because they provide the eyeballs which persuade the sponsors to part with millions of dollars. Perhaps if the teams were less dogmatic they might win the fans over. If during the big races, TV broadcasters were given access to the race radio channels (as happens in Formula 1) the fans would go with the argument. But at the moment, the argument seems to be: We want to be allowed to use our toys no matter what and we’ll go on strike or go slow if they’re taken away. Radios may have been permitted for the past decade or so but at the outset they snuck in through the back door. There was no debate. Lance Armstrong’s Motorola are credited with being the first team to use them and others quickly followed. Over the course of a generation the style of racing has changed. And with technology improving all the time, it won’t be long before the GPS machines on the handlebars will be able to calculate the average speed needed to catch a break and tell the rider which one of their electronic gears they need to select and what cadence they need to pedal at in order to catch them. It will be just like the exercise bikes at the gym where you chase a virtual opponent or have to keep your speed or cadence above a certain level because the screen tells you to. Now, maybe that’s your idea of where the sport should go in the future but the debate should be had. After all, cycling is about the head as well as the legs and we want to see riders who can read a race and can act with a certain guile, cunning and tactical ingenuity, don’t we? Or do we want a physiological utopia where the strongest always wins? Because we’ve been down that road and it didn’t turn out too well.